By offering a user-friendly, affordable robot that work right alongside people on ever-changing tasks, Universal Robots has lowered the automation barrier tremendously, pioneering the collaborative robot industry, now the fastest growing segment of industrial automation. UR’s collaborative robots – or cobots – deliver all advantages of advanced robotic automation with none of the traditional added costs associated with robot programming, set-up, and shielded work cells. 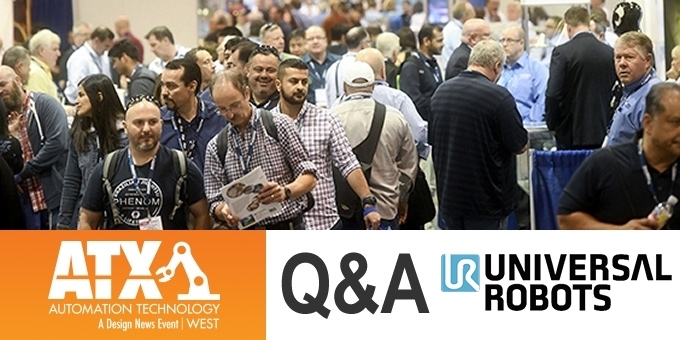 ATX is the largest automation show on the West Coast, it's a unique opportunity for us to expand our reach here while also supporting our rapidly growing partner network in the region. It's in the hands-on demos that manufacturers visiting our booth experience that really make them realize just how easy the UR cobots are to set up and program. Manufacturers struggling to get CNC machines to communicate directly with their collaborative robot now have a solution: VersaBuilt’s CNC Communication URCap is a simple yet powerful interface for machine tending applications with Universal Robots. The URCap allows a UR cobot to easily execute any machining program stored on the CNC directly through the cobot’s own teach pendant. 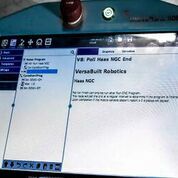 Initially launching for Haas CNC machines, VersaBuilt will develop UR interfaces for other popular CNC makes later this year. Visitors at our booth can also experience the first solution for random robotic case erecting, the XPAK ROBOX™. 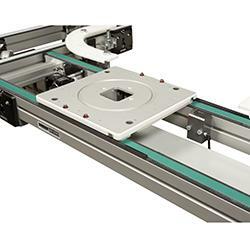 The box erector, powered by a UR10e cobot arm allows packagers to randomly erect any box in their suite on-demand without changeover. The collaborative design not only enables the operator to safely and intuitively interface with the machine, ROBOX also realizes approximately 60% reduction in terms of the footprint required for a similar machine using more conventional robotic technology requiring fencing. ATX & Design & Manufacturing West has many educational sessions, forums & Demo’s, is your company involved in any of them this year? • What is the role and responsibilities of a robotics champion? • How does the role fit into your overall organization chart? Who will they report to? Who will report to them? • What skill set is required for this role to implement an effective robotics strategy? • How to recognize the pros and cons of having a dedicated robotics champion within your organization. • What are the characteristics required of this executive to be effective with fellow team members and other departments? The market for collaborative robots, or cobots, is forecast to grow by more than 50% annually through 2022, with automotive and electronics representing key industries in terms of market share, according to ReportsnReports.com. Opinions are mixed as to what that will mean for the human workforce, though. Some reports say automation could result in net creation of jobs, while others warn that layoffs are inevitable. In this panel discussion, we'll talk to experts in the field to find out if a robot could really take your job or merely just change it. Collaborative robots or "cobots" are a new class of robots that are bridging the gap between fully manual assembly and fully automated manufacturing lines. Lightweight, flexible, easily programmable and safe to implement, collaborative robots can meet short-run production challenges faced by manufacturers that are adjusting to advanced processing in smaller batch sizes. This has become a critical competitive advantage for small and mid-sized specialty device manufacturers and is helping to fill automation gaps for larger OEMs with processes that couldn't be cost-effectively automated in the past. 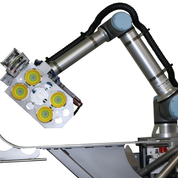 Join two robotics experts as they discuss how cobots differ from traditional industrial robots, and how to seamlessly integrate specialty applications such as soft gripping for pick-and-place, and assembly. They will also provide examples of how manufacturers can increase production, improve quality, and reduce costs with collaborative robotics. Walking the expo floor, it’s always exciting and humbling to see just how many other exhibitors are featuring UR cobots in their own applications now. As mentioned, we have created UR+ a showroom/platform that connects users to our ecosystem of partners providing UR-certified ready-to-use cobot accessories. We look forward to seeing the cobots with new UR+ products from exhibitors such as Schmalz, ATI, and LMI Technologies along with local distributors such as Numatic Engineering and MSI Tech. We keep seeing the UR cobots in new IIoT and machine learning applications, propelling the connected factory, enabling new tools and features including remote access and monitoring. Our recently published case studies highlighting UR cobot deployments at Voodoo Manufacturing, and Autodesk provide valuable insights into this new robotic frontier. We need to see the robot as a colleague that works right next to us in close collaboration, not simply as a machine that takes over manual labor and gets people fired. Employees with no prior programming experience are now promoted from operators to robot programmers. The result is an improved work environment where humans are freed up to focus on more rewarding tasks – both financially and mentally. Putting knowledge back to the factory floor will perhaps be the best long-term result derived from leveraging collaborative robots. The industrial revolutions created enormous wealth, but at the same time it has removed passion and knowledge about the product from production itself. If we can close that gap again — if we can somehow mix people and machines in the right way on the factory floor, we see enormous potential there for value adding, rather than just cranking up production levels. It’s qualitative change. At Universal Robots we call this Industry 5.0.